(Admission Office – Van Lang, 10th, December 2018) – Faculty of Architecture Van Lang University is among the "top" faculties of students participating and winning many scientific research awards to date. In 2018, to continue to uphold that tradition, the students of Architecture excelled to bring 10 scientific research awards at prestigious contests nationwide (in total of 18 student awards in the 2017-2018 school year). 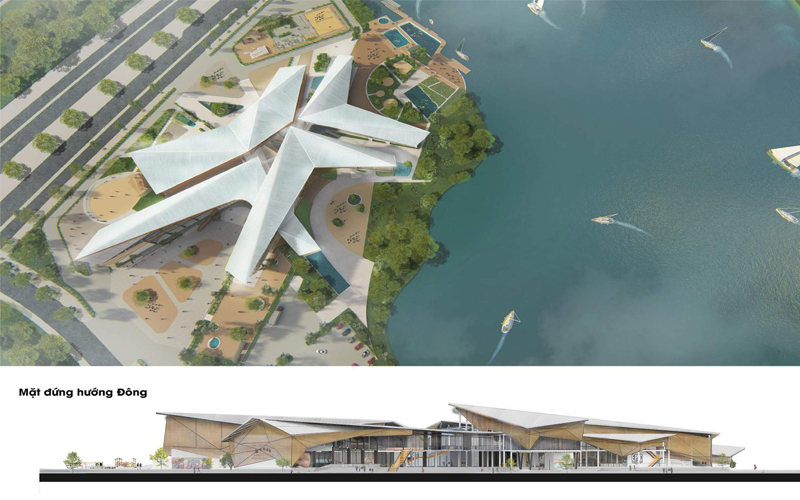 Maintaining stability throughout the school year, architecture shows itself to be one of the "leading birds" in the school-wide student research movement. For Architecture students, the graduation project is truly a "spiritual child", invested by each student for one semester and defended just 20 minutes in front of the Graduation Council. That achievement is the tireless efforts of teachers and students. That achievement is the tireless effort of teachers and students. Many of the students' Graduation projects have won awards in many domestic and foreign architectural creative competitions, looking back at a "bumper" season of the award winning "architectural family" Van Lang! * First prize: Photography - Tran The Anh (3rd year student). * First prize: Painting - Tran Tuan Kiet (4th year student). * First prize: Almighty - Nguyen Thanh Nhan (4th year student). 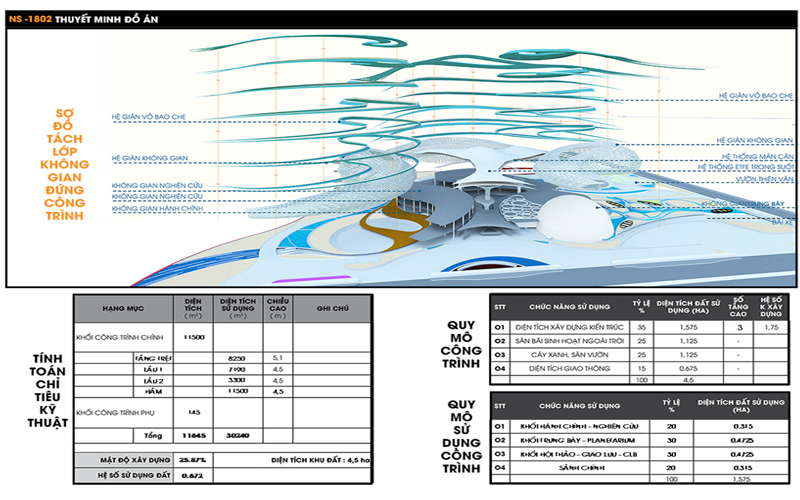 * Second prize: Fast Design A - Chi Nguyet Khanh (4th year student). * Consolation Prize: Painting - Nguyen Thanh Nhan (4th year student). National Architecture Student Festival in 2018 is held at the Architecture university of Ho Chi Minh city (takes place from April 22-25, 2018), with the theme "Students of Architecture: Exchange - Creativity - Integration". Nearly 600 students and lecturers from 21 universities with domestic architecture training and 2 from Thailand and Indonesia participated in 5 contents: Painting, Photography, Presentation, Quick Design A (for for second year, third year students) and Quick Design B (for fourth and final year students). Participating in the XI Festival, Van Lang Group has 30 members including 25 students and 5 lecturers. In this playing field, Van Lang students have had interesting experiences, especially outstanding for the first 3 prizes, 1 second prize and 1 encouragement prize. Eureka Science Research Award is a prestigious one for students who are passionate about scientific research, contributing to promoting the scientific research movement of students from different universities which are organized by HCM City Council in collaboration with HCMC National University. 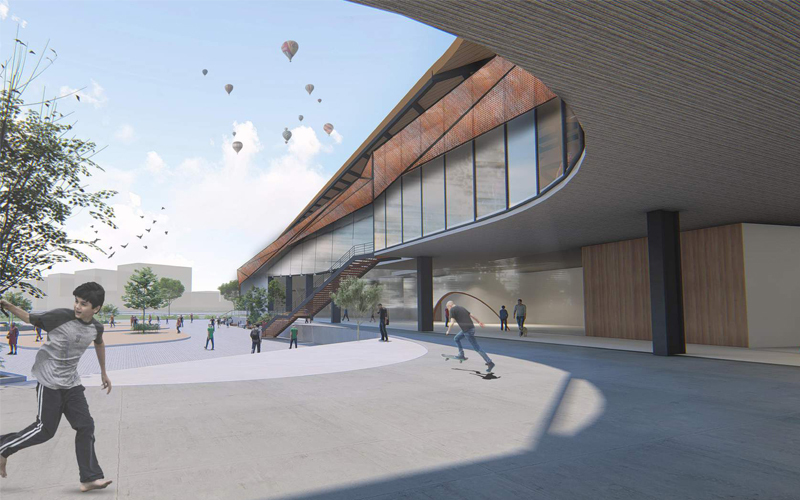 Van Lang University's Department of Architecture is also one of the annual "new guests" of the award. This year, the lovely western girl Tran Thi Truc Xinh with the theme "Improving the traditional fishing boat of the people in the Southwest to serve river tourism" - (Instructor: MA. 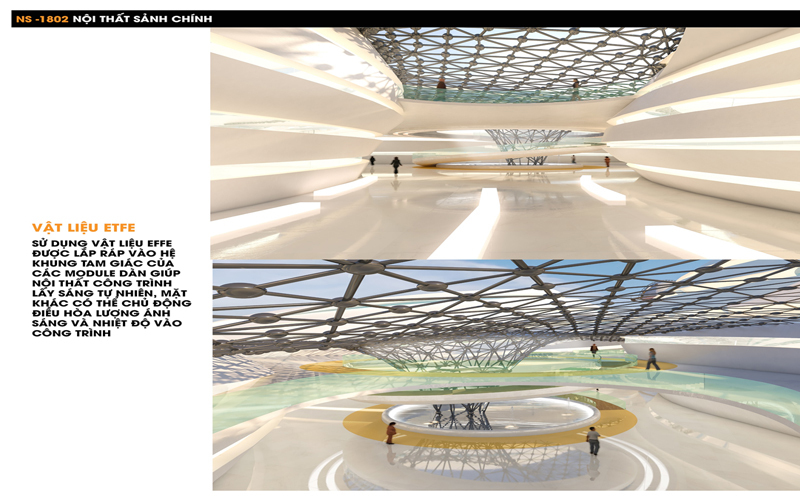 Mai Le Ngoc Ha) has been excellent in 12 finalists of architecture and construction planning. Truc Xinh said: "This is the second time I have participated in the Eureka Science Research Award. It has not been able to achieve the highest results but it is the result of my efforts over the long term. In order to achieve this result, I have received the support and suggestions from the teachers through the Faculty Science and School-level scientific competitions, especially the extremely enthusiastic guidance of Ms. Mai Le Ngoc Ha. This is the first step for me to accumulate experience, because after each look back, I will overcome the shortcomings in each topic. " The idea of ​​Truc Xinh comes from the actual needs, the potential of the river tourism. "Boat Homestay" was born, retaining the traditional shape of the fishing boat including the frame and original shape, but replacing the cover material and interior. The main materials are environmentally friendly such as bamboo (wall coverings) and star wood (making frames and boat seats). 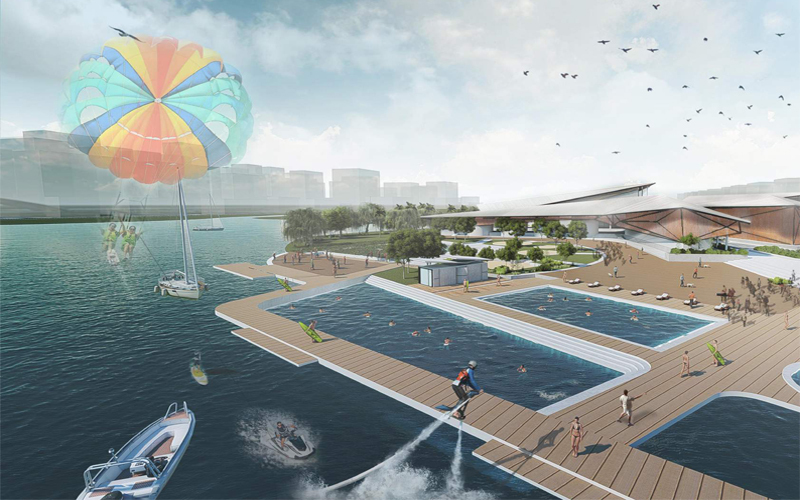 In the future, Boat Homestay will turn the wharves of Saigon into a place for trade of goods, tourist wharves, and forming a floating market in the heart of Saigon. Boat Homestay can exploit and use short-range inner-city routes to become the city's specialty; more specifically, like Grab takes advantage of wasted cars, Airbnb takes advantage of wasted houses, then the Boat Homestay model utilizes wasted cargo boats to serve traffic. 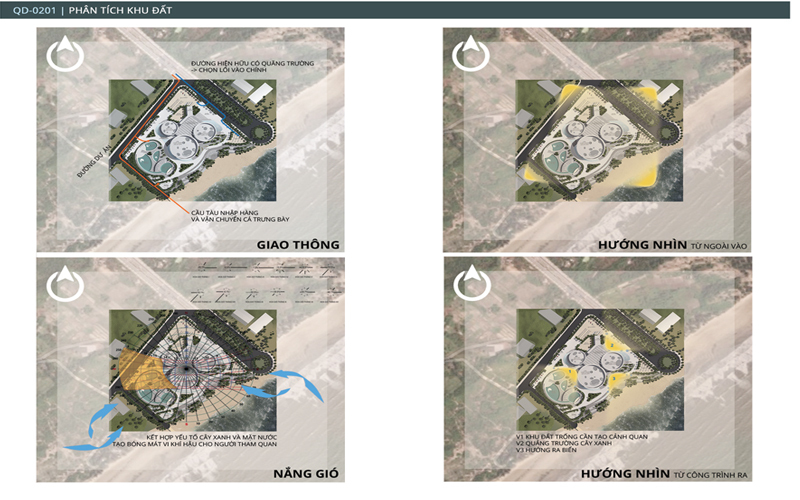 Loa Thanh Awards, chaired by the Vietnam General Construction Association, Vietnam Association of Architects, Ministry of Construction, and Central Union, is a playground for students nationwide with the best graduation project in the fields of Construction and Architecture. On November 26, 2018, the Loa Thanh Awards Council in 2018 selected 72 excellent graduation projects to award. Van Lang University excelled at winning one second and three third prizes in the competition, then writing the achievement table at the professional architecture playground. "After a while leaving the school, having the opportunity to experience real work, the results of Loa Thanh suddenly reminded me of a period, a precious journey of students. The best thing is that the experiences and perspectives on a local issue where I live can be accessed and shared with more people. I do not dare to use inspirational words, but hopefully with this topic, I have shared with students who have the opportunity to approach graduation projects this year; please select a topic that brings you joy, emotion and value, but the key of a student project is to contribute to social awareness. Topics can start with the small and closest things. I’m profoundly grateful to my teachers and friends for supporting me in the project. The Loa Thanh Award is only a milestone, an assessment that reminds me that I still have a good track in the current study and architecture work. It is also a motivation for me to try and further academic enrichment as well as practical path ahead.”- Van Thinh was still touched when he mentioned the prize. 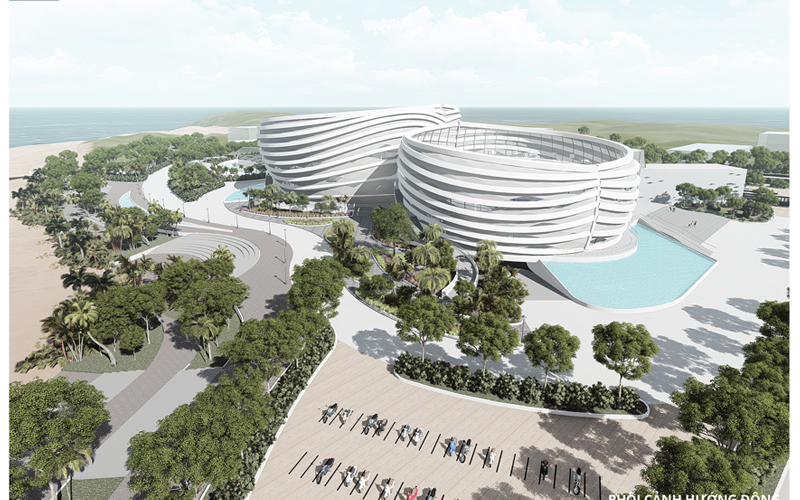 Inspired by the flora and sand dunes, "Ninh Thuan Agricultural Research and Development Center" is present as a gift of nature, a source of living for human beings, a meeting place for exchanges of production between humans and humans with nature. All create a strong agricultural relationship, an interesting and colorful harmony. A child of Ninh Thuan has designed a project towards the hometown with empathy for difficulties in "sandy land". 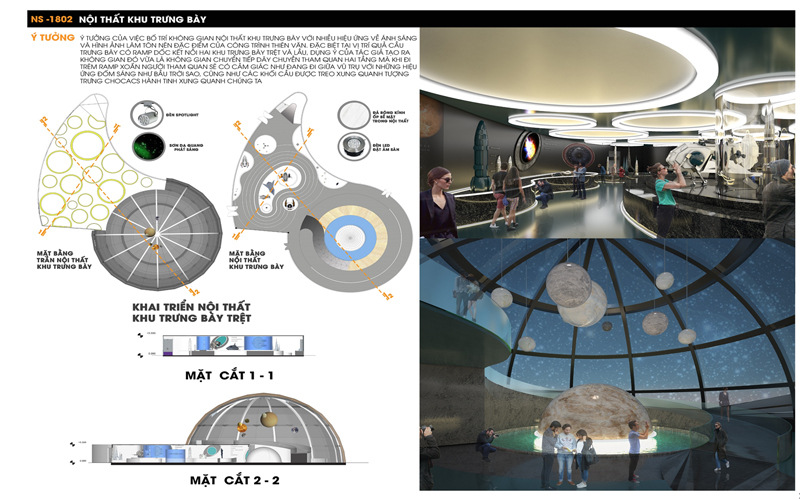 The birth of the Center for Exchange and Astronomy Research will contribute to the dissemination of science, especially astronomy to the city's youth, which is more diverse and effective, creating a meaningful playground and healthy, increasing dynamism and positivity in the process of exchange and integration. 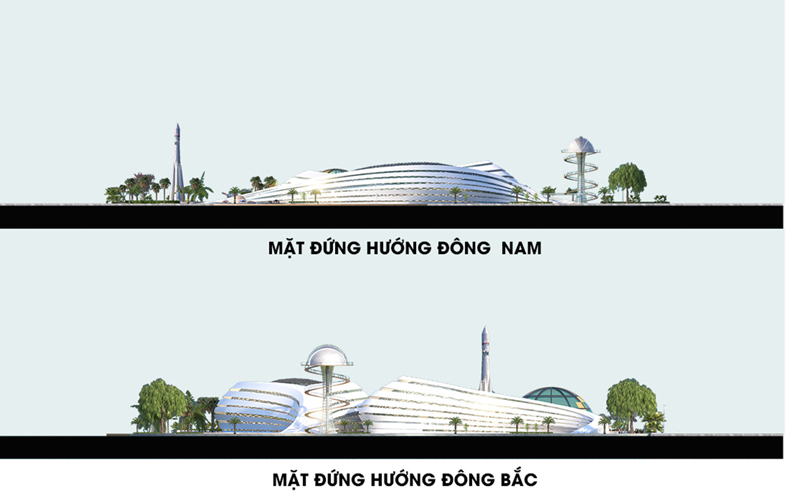 Young people with passion and astronomy love will have a useful playground that promotes scientific and technical relations between Vietnamese youngsters and international friends. 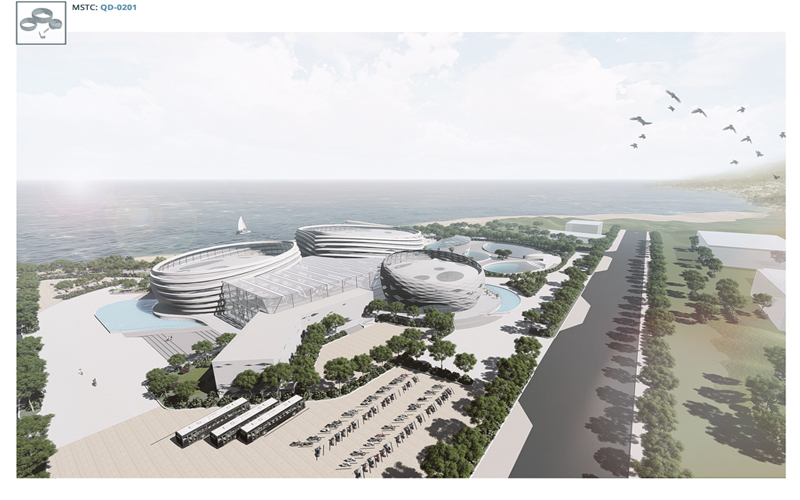 As for topic "Marine exhibition center at Vung Tau city", Quang Dong took the idea of ​​the basket boats to make the main shape for the project. 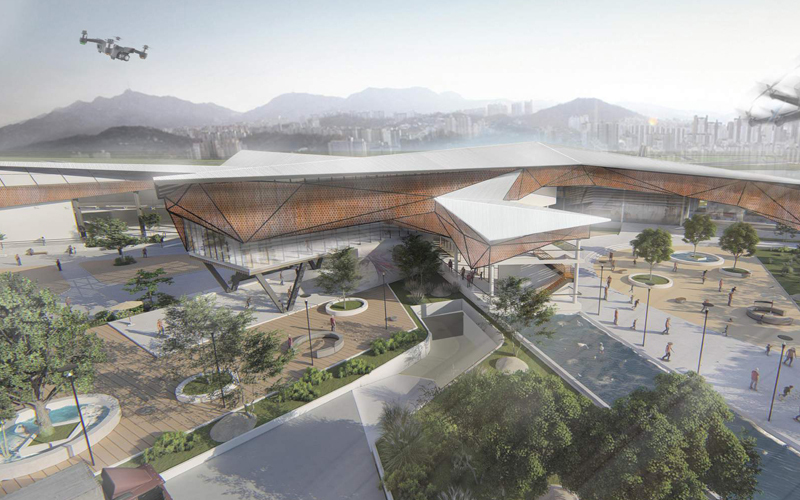 The image of the whale skeleton creates two main blocks (exhibition and aquarium) with a BTCE concrete frame structure. The cover of the project is aluminum plastic sheet. 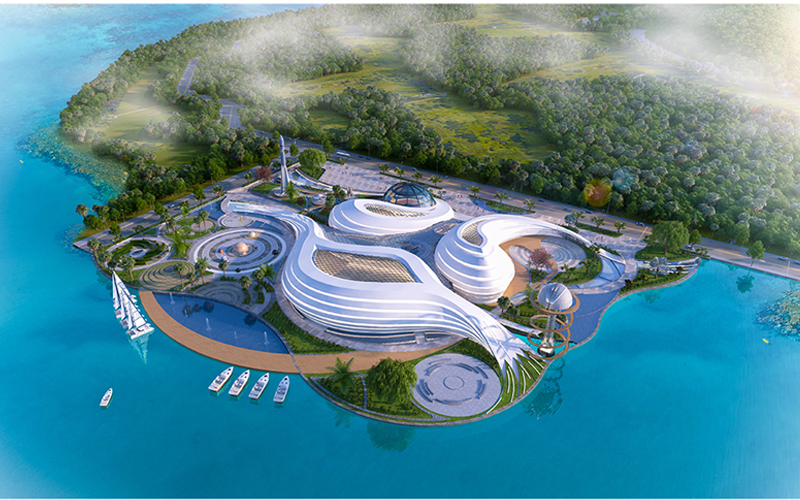 Understanding the advantages and potentials of marine tourism, Quang Dong aspires to create a mixed-use entertainment center such as recreation and exhibition of marine life combined with education to raise people's consciousness in preserving environment and nurturing space, conserving diverse marine natural resources in beautiful coastal Vung Tau city. Facing the reality of youth culture in the center of Ho Chi Minh City, not to mention some degraded items, there is not enough room and space; therefore, it is difficult to meet the ideal playground for young people. 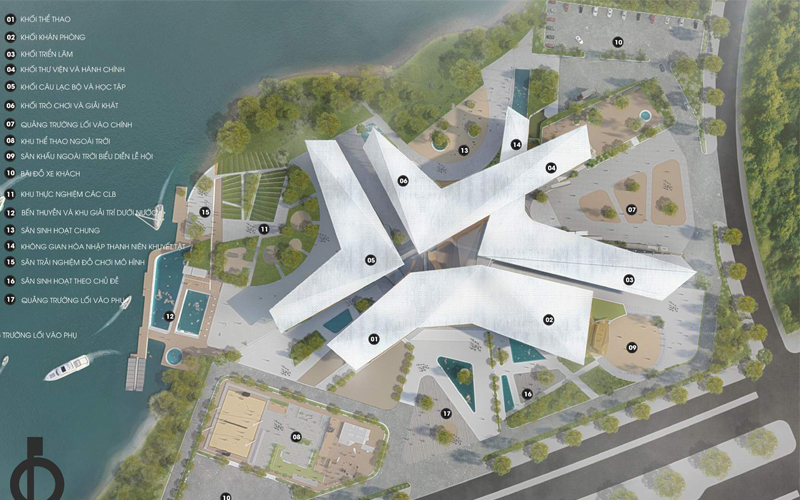 Besides, together with the development of Ho Chi Minh City, it requires a positive change in terms of architecture, space and location to build a Youth Cultural House. 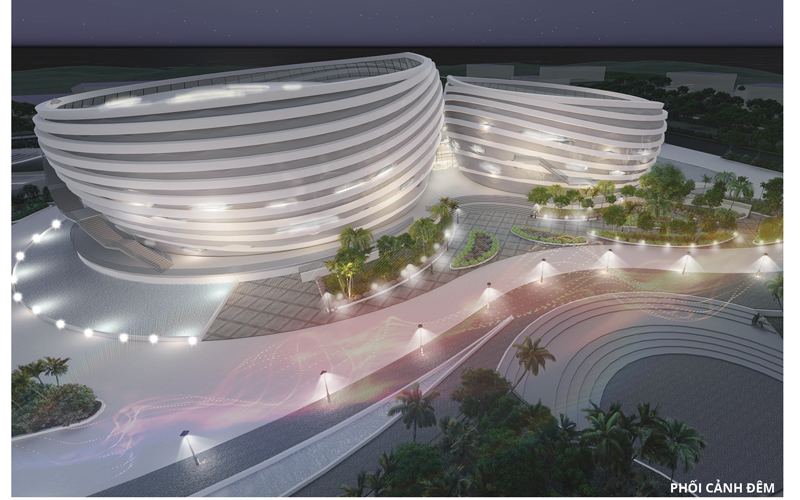 Student Ngo Minh Trinh Nghia has developed the topic "Youth Cultural Center of District 2" – (Instructor: MA. Nguyen Thi Kim Tu). Getting ideas from Saigon cultural characteristics with the visual beauty of Orimi culture - Japan, works are as a combination of local culture and the world. The lines cut randomly but still harmoniously are inspired by the alleys of the Saigon culture in order to create a harmonious mass and airy spaces, evoking the feeling of a typical Saigon. 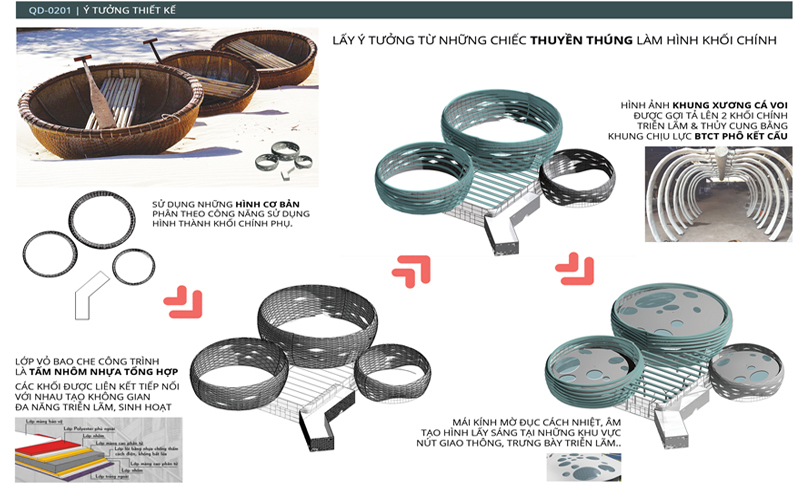 *Recently on 17th December 2018, the group of Van Lang architecture students (Uong Dai Vu, Nguyen Thi Cam Huong and Vu Minh Tam) achieved the 3rd place of the the Spec Go Green International Awards 2018 with the topi: Spirit of An Giang Floating Village. This reward closed the “winning year” of Architecture students, Van Lan university. On 12th January 2019, the exhibition and award ceremony of Green Architecture for young architects and architecture students Spec Go Green International Awards 2018 would operate at the Vietnam Association of Architects’ headquarter Office 40 Tang Bat Ho, Hai Ba Trung, Ha Noi. Hopefully, the awards won in 2018 will be the driving force and the great spiritual encouragement for teachers and students of Architecture Faculty to continuously achieve more success in 2019..